Out of favor left-hand batsman, Fawad Alam is expected to make a comeback in the Pakistan A team against Australia for the upcoming ODI series in October at UAE. According to the sources, the selection committee headed by Inzamam-ul-Haq is considering to give a chance to Fawad who last time wore green in 2015 against Bangladesh. The 32-years-old Fawad have an impressive first class record scoring 10744 in 146 outings at an average of 55.09. 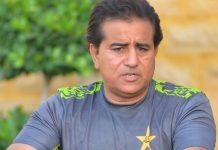 Fawad who hails from Karachi had also attended the training camp ahead of the Test series in England but couldn’t make it to the final squad. Test batsman Asad Shafiq is strong candidate to lead the men in green against Australia in UAE, sources said. Sami Aslam, Asad Ali, Muhammad Asghar, Bilal Asif, Rahat Ali, Shan Masood, Mir Hamza, Muhammad Rizwan and Hussain Talat are the other players who are likely to be included in the team.